The Foundation is recognized at the regional and national level for its contributions to the scientific and educational community, and for its work in specialized and integral attention to treat different dementias since 1998. Since 2004, The Foundation has organized several Scientific Meetings, with national and international guests, designed for in-depth discussion on advances in the diagnosis and treatment of Alzheimer's disease. “Impact of Alzheimer's disease in the family” Neuropsychologist, Jacqueline Arabia & Gerontologis Inés Naranjo de Gómez (2006). “Bio-Psyco-Social Repercussions of Alzheimer's Patients' Caretakers”, Psychologist Leonor Sandoval (2010). "Family dynamics' influence in the mental health of colombian dementia cartakers": Megan Sutter, BA1, Paul B. Perrin, Ph.D.1, Yu-Ping Chang Ph.D., RN2, Guillermo Ramírez Hoyos, BS 3., Jacqueline Arabia Buraye, MS3, and Juan Carlos Arango-Lasprilla, Ph.D.4. (2013). Alzheimer's Disease American Magazine. "Audio-verbal memory in elder people with a minor cognitive deterioration and a control group": Sanchez, AM., Arevalo, K., Vallecilla, M., Quijano, M.C. & Arabia B., J. (2014). CES Psycology Magazine, ISSN 2011-3080, 7th Volume Number 1 January-June 2014 pp. 35-47 (2011). 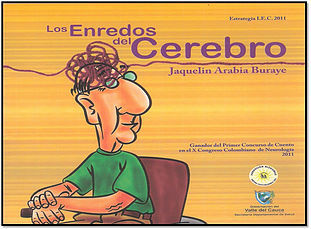 The short story “The Tangles of the Mind” was written by its Founder, Jacqueline Arabia Buraye, and won the First Short Story Contest in the X Colombian Neurology Symposium (2011). Psychologist, Pontifical Javeriana University, Cali, Colombia. Magister in Mental Neuropsychology, Science and Medicine Foundation and Complutense University of Madrid. Director and Founder of the Alzheimer's Foundation, Cali, Colombia since 1998. Over 18 years of experience evaluating, rehabilitating and integral therapeutic handling people with cerebral damage, especially treating dementias. She is the founder and has led the Alzheimer's Foundation in Cali Colombia from the beginning. She has been a Community and College teacher and has developed activities for the promotion and prevention in the community. She has organized Scientific Meetings, mental stimulation and memory workshops, family support groups, and education and consultant's meetings for families and caretakers of patients with some type of cerebral damage. She has led and accompanied national and foreign groups of researchers in findings and discoveries of the disease. Winner of the first investigation contest in the XVIII NATIONAL CONGRESS of the ALZHEIMER, MONTERREY, MEXICO, MAY 2013 “CARETAKERS CATEGORY” and in the VII LATIN AMERICAN ALZHEIMER'S CONGRESS, October 2013 Montevideo, Uruguay. Becuase of their work the Therapeutic Centers of the Foundation also became a pioneer of applied playful therapies to patients with the disease.